Is laughter the best medicine? I certainly hope so and would not hesitate to prescribe a healthy dose of Joseph Haydn (1732-1809), twice daily. Surely music by a composer who delights in silliness, outrageous wit and the breaking of all conventions, can only be beneficial. 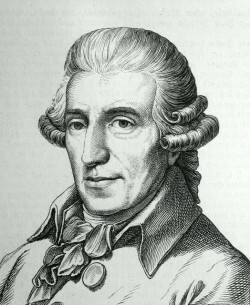 Georg August Griesinger, an early Haydn biographer, described one of the composer's main character traits as 'a sort of innocent mischievousness, or what the British call humour'. Another contemporary of Haydn's, Albert Christoph Dies, reports that he confessed to sometimes experiencing how 'a certain kind of humour takes possession of you and cannot be restrained'. Anyone who occasionally has an involuntary fit of the giggles will know the feeling. But how does this translate into music? Griesinger commented that especially Haydn's 'Allegros and Rondeaux are often intended to lure the listener into the highest degree of the comical by frivolous twists and turn of the seemingly serious'. Alfred Brendel, who lists laughter as his favourite occupation, has written a wonderful essay, 'Does classical music have to be entirely serious? ', in which he makes the point that Haydn's aim was to stimulate the listener 'to take the comical more seriously, and accept it as part of one's own life.' Humour in music is by no means only found in Haydn; throughout music history, from Schumann to Rachmaninov, from Rossini to Ligeti, there is indeed much to enjoy for the devoted jokester. But the closest parallels, I feel, exist with Scarlatti and Beethoven, where silliness sometimes takes on a delirious form and teasing becomes rampant. Although it is one of the basic cognitive experiences, humour works on many levels and will vary greatly between cultures and particularly between languages. Given this, it's not unreasonable to hope that incorporating humour into music will make it more accessible, and possibly more universal. I certainly don't expect the audience actually to laugh out loud (or roll in the aisles, so to speak) during one of my concerts; and if it were to happen, it would be disconcerting not to know for certain if I was being laughed with or at. But the odd carefully timed pianissimo chuckle is definitely among the less irritating noises you get in a concert hall. Much also depends on one's delivery: musical jokes are a lot more difficult to play than to tell, and using grimacing, gesturing and other tools reserved for stand-up comedy in a 'serious' recital will turn it into a 'sit-down tragedy'. In the case of Haydn, however, there is no need for anything extra-musical: the surprise element, an essential ingredient of humour, is always present in his works. Whether he uses shocking silences, tonal ambiguity or even ridiculous instructions in the score, they are guaranteed to amuse and delight (and sometimes insult); all often sorely missed emotions during a concert. All accounts of Haydn describe him as an extraordinarily warm, kind and generous person. Because of these qualities, rather than his age, he was affectionately nicknamed 'Papa Haydn'. He also became known as 'Papa' of the symphony and the string quartet because of his unmatched contributions to these genres. I would place him towards the top of the family trees of both the piano trio and the piano sonata as well, as Haydn's achievements in those genres are no less wondrous. Until recently his sonatas have received far less attention than, for instance, Mozart's. Nowadays, however, it is widely acknowledged that many of the Haydn sonatas eclipse some of Mozart's in their originality, unpredictability and imagination, while always, like Scarlatti's, offering a huge variety in interpretational possibilities. Haydn also revolutionised the sonata form, and it was not until Beethoven, one of Haydn's more temperamental pupils, that the sonata form progressed further. (Incidentally, during a temporary truce between student and teacher, Beethoven respectfully dedicated his first set of sonatas, Op. 2, to Haydn, just after the latter had completed his great sonata cycle around 1794.) Despite the growing recognition for Haydn's sonatas, I still wish that they, and his more than a dozen other piano pieces, were performed more frequently - they deserve to be taken much more seriously, in an unserious sort of way. Unlike most Scarlatti sonatas, Haydn's more mature keyboard pieces were not intended for the harpsichord but for the piano. From his correspondence with his friend Maria Anna von Genzinger it is quite clear how much Haydn appreciated the many different colours and dynamic capabilities of the latest instrument models. During Haydn's first visit to London in 1791-92, he is reported to have been bowled over by the large and robustly built English Broadwood pianos. But even the most modern instruments of course differed enormously from the grand pianos of today. Their action was much lighter, the keys more shallow and their hammers smaller. All this directly affects not only the sound, but also the execution of the pieces. When performing them on a modern piano, I therefore consider, like in Scarlatti, that it is the interpreter's responsibility to make judicious adjustments where appropriate, whether in the use of dynamics or ornaments, or the colouring of different registers; whatever works, really, and doesn't interfere with the essence of the composer's original musical thought. Probably to the delight of many a period instrument enthusiast, I will freely admit that certain qualities of the modern grand bring more headache than joy. One case in point is the interesting 'side-effect' resulting from the longer strings combined with the much more powerful sustain pedal. In the Fantasia (Capriccio) in C major, Hob.XVII /4 (1789), Haydn on two occasions instructs the performer: 'Tenuto intanto, finché non si sente più il suono' - hold until the sound is not heard any more. Even on an early piano the resulting fermata is ridiculously long, but in modern times this joke completely backfires: by the time the modern string has stopped vibrating and the sound disappears, the listener has had plenty of time to get up for a cup of tea and - depending on the weather - a brief stroll in the park, and can still be back in his seat in time for the concluding passage. For this effect to work in performance, adjustments have therefore to be made somehow. Another awkwardness is the concluding cascades of octave glissandi, a technique also favoured by Beethoven in his First Piano Concerto and 'Waldstein' Sonata. (So much for Beethoven's claim that he had not learned anything from his teacher!) These octave glissandi left far fewer blood stains on earlier pianos, with their shallow action. The Fantasia is a Presto and one of Haydn's most virtuosic works; full of nauseating hand-crossings between extreme registers, and invigorating double-third passages, designed to keep most bodily extremities in shape. Haydn's biggest joke, however, was probably the letter to his publisher where he writes that the piece is 'not at all difficult'. The cross-rhythmic patterns of three pairs of semiquavers established in 6/8 bars give this outrageous piece an almost jazzy feel, alternating with fugue-like sections. On the basis of the Fantasia it seems that Haydn may also have been a feline enthusiast. In a parallel to Scarlatti's famous 'Cat fugue' sonata, the theme of which was allegedly inspired by his cat walking across the keyboard, Haydn found inspiration in the folk-song Do Bäuren håt d'Kåtz valor'n (The peasant woman lost her cat) for the main melody of the Fantasia. Much more serious in character, but no less quirky, is the Sonata in B minor, Hob. XVI /32, the last and clearly the pinnacle of a group of six sonatas that Haydn composed between 1774 and 1776. Less frequently performed than the rest of the set, this sonata is somewhat of an oddity: out of the 62 sonatas that, with a high degree of certainty, can be attributed to Haydn, only eight are in a minor key, and of these two are still lost. Minor keys were often used by 18th-century composers in the aid of two main expressive currents; Sturm und Drang (Storm and Stress) and Empfindsamkeit (Sensibility), anticipating the arrival of Romanticism. Haydn felt that the set as a whole was 'unsuitable for the traditional amateur market', and this sonata in particular is, arguably, his most eccentric piece. Its declamatory and often demonic character, already established in the opening of the first movement (Alle gro moderato), is often contrasted with beautifully intimate and delicate moments along the way. The restless style resembles that of some of Haydn's string quartets, particularly the Fifths Quartet, Op. 72 No. 2. In fact the structure, attention to the voices and the resulting dialogues are wonderfully chamber music-like. The build-up in the development section reaches Beethovenian levels of fury and to me this sonata is the closest we ever get to Beethoven with Haydn; this time around possibly a case of the teacher respectfully looking over his student's shoulder. The slow minuet has a graceful, nostalgic quality and is more a reminiscence of the dance, rather than the actual activity. It is interrupted by a grumpy trio in which no thing can be taken at face value. The last movement is another bad-tempered affair, bristling towards its close with the rapid-fire fortissimo octaves. The type of frenzy witnessed in the movement is rarely encountered elsewhere in Haydn's œuvre. The repeated, detached quavers of the theme in the Presto have a built-in element of urgency, a type of figuration which to me is usually associated with a more sinister symbolism in music: whether the popular idea of fate knocking on the door in Beethoven's Fifth Symphony, the satanic, ominous calls found in Scriabin's 'Black Mass' Sonata or the devilish mischief and pyrotechnics performed by Ravel's Scarbo. The Sonata in C major, Hob.XVI /50, is the second from the group of three sonatas nicknamed the 'English Sonatas', because they were conceived while Haydn was visiting England for a second time between 1794 and 1795. I can think of no other keyboard sonata that contains quite so much wit. The teasing starts from the opening bars of the first movement (Allegro), where Haydn is probing carefully, without being quite sure of how to make his opening statement (in total contrast to the opening of the B minor Sonata). The movement exhibits many traces of variation form, as in fact does the whole sonata. The opening detached quavers are restated after a few bars as majestic, arpeggiated chords, resonating later in the descending octaves of the left hand. In this delightful sonata so much can be done on the modern piano with articulation, ornamentation, colours that it is almost necessary to restrain oneself. What seems like another joke ensues when Haydn (or a later editor?) orders the use of 'open pedal' for several bars in a row in the development section and then again in the recapitulation; whether he actually meant the una corda or the sustain pedal is still subject to argument. Unfortunately Haydn's autograph is lost, but the way this is notated in the score suggests to me that he had the sustain pedal in mind and I am more than happy to obey. And why not use a bit of both pedals as a cheeky compromise? The almost Scriabinesque sound effects that can be achieved in this way are absolutely delightful. But the absence of 18th-century instruments capable of such results (at least on the continent) certainly allows for doubt: could Haydn have been thinking that far ahead? The Adagio was composed in 1794, in a slightly different version which was later revised to go with the outer movements. For this recording I have re-inserted some of the original material that I feel fits quite well. The movement exhibits highly expressive, at times even rhapsodic moments, juxtaposed with poignant, minor-key sections. In the recapitulation Haydn has written out imaginative ornamentations of the theme which come across like coloratura embellishments in the operatic scena of a great prima donna. The flamboyant style of the last movement (Allegro molto) is very much like that of the Fantasia. It is an annoying hyperactive child at best or a manic-depressive patient at worst, with Haydn using all the tools at his disposal to break away from anything that is remotely predictable. He deliberately avoids four- or eight-bar patterns and utilises abrupt silences: splendid nonsense at its best. He flirts with the tonal directions of the theme, breaking out into the fury of D minor only to change his mind two bars later. This happens repeatedly and when the performer crashes into B major already in the second phrase, the light-hearted humour turns into black comedy: it is starting to look like a severe memory lapse. So what to do? How to get out of this B major 'mess'? Should one simply apologize, pack up and go home? Fortunately, Haydn provides a last-minute solution. Ornamentation in Haydn is an art rather than a science, much the same as in C. P.E. Bach and Scarlatti. In many instances Haydn writes out decorative elaborations when the themes return, or for selected repeated passages but, in the case of repeats in general, the ball is clearly in the performer's court and there are a gazillion possibilities. If the repeat after the exposition or recapitulation was going to sound exactly the same one might as well press the 'rewind' button. But whether the variations are made in terms of articulation or ornamentation, nothing must interfere with the original thought of the composer. A good example of the challenges this poses is the Sonata in E minor, Hob.XVI/34, published in 1783 (but probably composed much earlier). This piece screams out for some variation in the repeats (unlike the B minor Sonata and the F minor Variations where it feels much less called-for) and, in the finale, Haydn himself clearly writes out the elaborations. The opening movement, Presto in 6/8, is a compilation of playful yet fateful fragments that never seem to gather momentum and, every time they try to, Haydn inserts a full stop and the music suddenly grinds to a halt. A poignant, nostalgic theme ensues, echoing Scarlatti in some of his slow sonatas. The movement is somewhat of a shooting star, appearing from nowhere and quickly expiring again with its three octaves at the end, while hardly anything takes a definitive shape in between. The Adagio exhibits highly expressive moments, in a recitative style. The movement never hastens past but it does not really end either, as it breaks directly but innocently (innocentemente) into the last movement. (The seamless transition between movements is another technique that Beethoven adopted and made 'his own'.) It is not until the closing movement, Vivace molto, that a sense of continuity is present throughout. The simple song-like melody, once it gets going, is sung in one long, almost uninterrupted, breath from start to finish. Here, unusually, lyricism and mischief go hand in hand. The Vivace molto may be perceived as having a double-variation form, very much like the Andante con variazioni in F minor, Hob. XVII/6 (1793-94). Involving minor and major variations in alternation, this piece is a prime example of the technique in which Haydn specialised from 1770 and which he refined, following in the footsteps of C. P.E. Bach. He dedicated it to Barbara Ployer, Mozart's pupil and a great keyboard player. Judging by the dedicatees of the majority of Haydn's works, it becomes clear that he overwhelmingly targeted performers of the domestic type - often female, but under no circumstances timid, as can be seen from the technical demands of these pieces which, unlike his symphonies, were written to be enjoyed in intimate circumstances, rather than large public venues. Written in a concertato style, the variations were originally conceived as the opening movement of a sonata. In the autograph, it is obvious that Haydn later extended the movement, ending it with a coda. The piece eventually evolved into a free-standing composition, entitled Un Piccolo Divertimento ('a little entertainment').The title is somewhat misleading: just as there is nothing trivial or easy about Beethoven's Bagatelles (Kleinigkeiten), or nothing really funny about Schumann's Humoreske, there is nothing entertaining about this divertimento; it is deeply profound, tragic music, with a death theme running through it, and without any hint of irony or light-heartedness, unlike the other works on this recording. In fact some believe that Haydn wrote this piece for the death of Mozart (in 1791), as the constant presence of a dotted rhythm gives it a hypnotic, funeral march-like character. One can find some consolation and a hint of a smile starting to form in the major-key sections, but only through tears of deep sorrow. Charles Rosen remarked that Haydn created 'an emotion that was completely his own and that no other composer, not even Mozart, could duplicate - a feeling of ecstasy that is completely unsensual, almost amiable'. Mozart conceded that 'it was from Haydn that I first learned the true way to compose Quartets'. The exact number of string quartets that Haydn wrote is unknown although the latest estimate stands at 83. I find them all addictive. Just as his sonatas are incredibly communicative and chamber-music like, his chamber music strikes me as having a very pianistic potential. Particularly the fiery finale of the Quartet in D major, Op. 64 No. 5 (1790), nicknamed 'The Lark', lends itself quite well to having a little fun with it on the piano, and the resulting Larking with Haydn is my affectionate tribute to the Great Master.